It was an upbeat evening of ’90s nostalgia Sunday, July 21, at the DTE Energy Music Theater as Smash Mouth and Sugar Ray headlined Under the Sun, a funny four-hour package show of pop and alternative hits from the final decade of the 20th century. 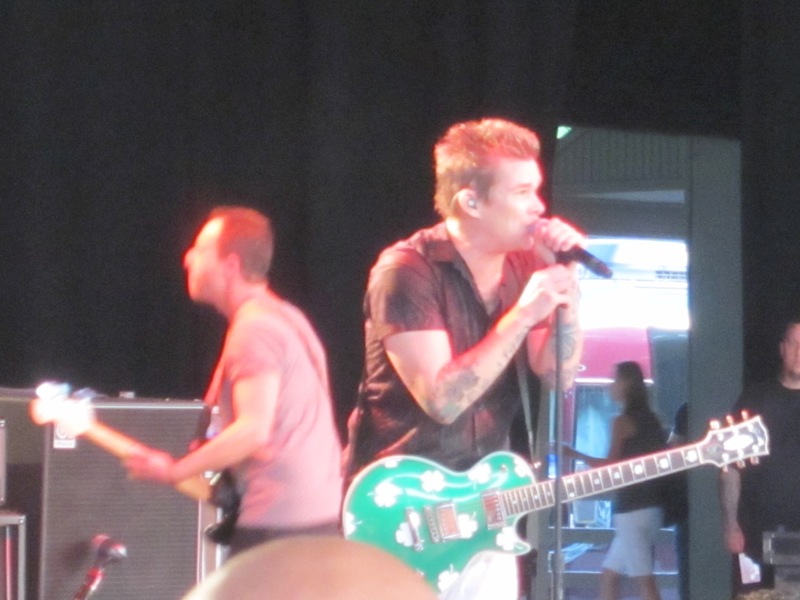 Lead singer Mark McGrath of Sugar Ray at DTE on July 21. Sugar Ray was the liveliest of the evening acts, thanks in part to McGrath’s constant commentary — which at times got in the way of the music but made it clear that the band considered the concert a celebration. McGrath’s frosty, spiked hair and white blazer screamed ’90s, and when he compared the show to “a U2 concert without the talent,” it was clear the group didn’t take themselves too seriously. During its 45-minute, eight song set, Sugar Ray played hits such as “Someday,” “When it’s Over,” “Every Morning” and “Fly,” sprinkling in lesser-known songs like “Under the Sun,” about growing up in Newport, California. The show started to resemble a comedy club, as McGrath took an audience member’s phone and began talking to the man’s girlfriend, but he told everyone he wanted them to have fun even though Michigan is going through tough times. An exctended performance of Violent Femmes’ “Blister in the Sun” certainly helped make that happen. Smash Mouth closed the night with a nine-song, 45-minute set filled with hits such as “Then the Morning Comes” and “Can’t Get Enough of You Baby.” Drummer Randy Cooke, bassist Paul DeLisle and keyboardist Michael Klooser all took solo spots, while the group’s cover of the Monkee’s “I’m a Believer” took audience members back to the first “Shrek” film – with DeLisle sporting a pair of ogre ears. Lead Singer Steve Harwell joked about keeping the shoe an audience member handed him to autograph, and Smash Mouth finished on an up note with “All Star,” although the lack of a formal encore left fans wanting a bit more Under The Sun from the band.